The train going towards Lajpat Nagar was put on hold after the railing fell on it. Hundreds of commuters on the Delhi Metro's Violet Line had a harrowing time this evening when a portion of the railing fell on a train near Lajpat Nagar, disrupting the flow of the metro services. The train which couldn't go ahead led to bunching of trains and a delay of at least an hour. Commuters at the Moolchand Metro station were told not to wait further as the trains weren't headed for Kashmere Gate. Those stuck inside the train had to walk along the verge of the track to reach the Lajpat Nagar Station platform from where they had to hop on to an alternative mode of transport. 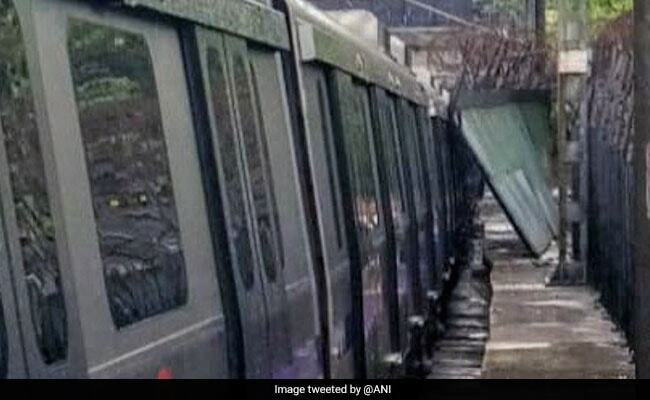 The Delhi Metro Rail Corporation (DMRC) attributed the glitch to strong winds and rain this afternoon. Train rides in short loops between Nehru Place and Escorts Mujesar (Faridabad), and between Central Secretariat and Kashmere Gate were stated after some time. "A portion of the railing along the ramp, where the train emerges from the underground Jangpura Station towards Lajpat Nagar, fell on the track that goes towards Faridabad around 4.05 pm due to strong winds and rain. Therefore, the train going towards Lajpat Nagar was put on hold," the DMRC said in a statement. To remove the obstruction, the overhead electrification was turned off between Central Secretariat and Nehru Place, it said. The movement of trains didn't resume before 5.45 pm on the single line from Nehru Place to Central Secretariat. The trains are still running slow.